The Noise Next Door are the U.K's premier impro comedy troupe, and in recent years they have taken the comedy world by storm. The Noise Next Door are the U.K’s premier impro comedy troupe, and in recent years they have taken the comedy world by storm. Five time sell-out veterans of the Edinburgh Fringe Festival and one of the country’s most sought after comedy club headliners, The Noise Next Door leave audiences everywhere in awe of their lightning-quick wit and totally original comedic talents. The Noise Next Door are Tom Houghton, Charlie Granville, Matt Grant, Tom Livingstone and Sam Pacelli. They have been performing their own distinctive brand of off-the-cuff comedy together since 2006. Taking audience suggestions, the cheeky and charming quintet, transform them into fantastically funny scenes and songs in the blink of an eye with a perfect blend of ludicrous characters, witty oneâ€ÂÂÂÂÂÂliners, epic stories, and explosive physicality. 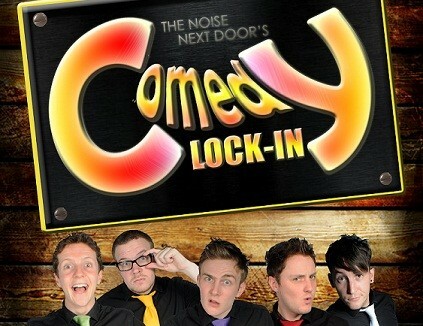 The Noise Next Door’s Comedy Lock-In is a totally unique entertainment experience with the quickest wits in comedy and their astonishing special guests. Each show features a hefty dose of The Noise Next Door’s trademark off-the-cuff madness, two stand-up stars, and some once-in-a-lifetime comedy curiosities. Unstoppably Funny and uniquely talented, The Noise Next Door are well on their way to becoming comedy’s next big thing.